Volvo XC60, after P1800 the sexiest Volvo ever, is coming to US market, so no surprise it is linked with new TV commercial. What we can expect? Beautiful shots on glamour car, exterior and interior views, slow motions and lady getting out of the car eventually? Not really. We watch something totally unusual, movie full of crashed cars. And yes, some shots on new XC60 in the end. Volvo that can stop itself. Finally. I admire that this is not excellence of creativity but good way how to demonstrate you positioning of safety. One of the first car commercial where we can see the car crash, damaged cars, was masterpiece and award winning campaign Safe happens for VW from Crispin Porter+Bogusky. Just to remind it. During the weekend, one of the biggest event in advertising world finished in Slovenian Portoroz. Advertising fiesta Golden Drum 2008. I was not so lucky to be there personally but anyway, the best works from automotive fields will be published on Carketing in next days. I have picked Volvo as first. Volvo XC60 was officialy launched in March at Geneva Motor Show. 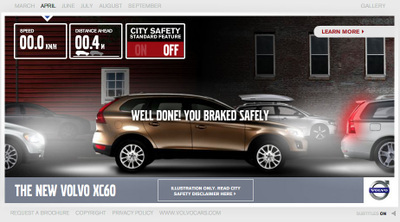 Although this beautiful car will come to European markets in fall 2008 (to US spring 2009), Volvo has alredy launched very nice XC60 microsite promoting this new SUV . Until the fall, Volvo reveals almost every month some of the great features of this car. How to brake XC60 in traffic rush period without or with City Safety? Try now!